Caring for your loved one living with dementia is a labor of love and can often be overwhelming and exhausting. We understand how difficult caregiving can be. 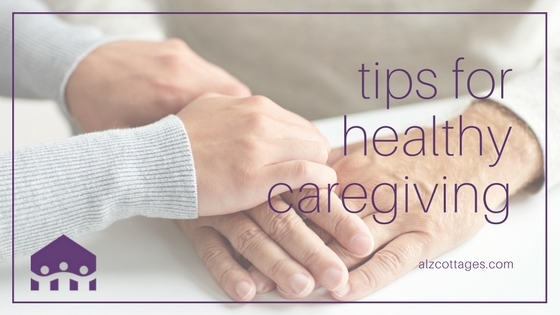 From our experience coming alongside families as they provide care for their loved ones with dementia, here are a few tips to help you as a caregiver. You may feel as though your loved one is your top priority, but if you fail to take care of yourself, it can take a toll on your own health and well-being. Taking care of yourself allows you to be a better caregiver for your loved one. Be sure to eat well, as making healthy diet choices can help you sleep better, give you more energy and mental clarity, and allow to enjoy daily activities with your loved one. Get regular exercise to reduce your stress and boost your energy level. Choose physical activities that appeal to you, such as gardening, walking, dancing or joining a local exercise group or class. Aim to get at least 30 minutes of moderate-intensity exercise at least five days a week. Most importantly, take time to refresh your soul. Seek out activities that calm your spirit and renew your mind. These might include prayer, meditation and focused breathing. Caregiving, particularly in the long term, takes a toll on every aspect of your life including family dynamic and finances. To avoid emotional and even physical problems, know the signs of burnout, including: anxiety, depression, irritability, fatigue, trouble sleeping, difficulty concentrating, eating or drinking more, avoiding leisure activities and feelings of resentment. Know that it’s okay to seek help and support from others as you care for your loved one. Give yourself a break and permission to rest and enjoy your own activities. Every caregiver needs a break now and then, that’s why we provide both short- and long-term respite care at all of our locations throughout Texas. And when it’s time for a permanent transition to long-term care, we are committed to walking with you every step of the way. It helps to be able to talk to others in a support group about your concerns in caring for a loved one living with dementia. Caring for someone living with Alzheimer’s disease or another form of dementia isn’t easy and it doesn’t become easier with time. At The Cottages, we understand how difficult memory loss can be and we are here to support you and listen to you. Whether it is through our monthly support groups for loved ones, our ongoing caregiver support, or through our grief counseling, we provide ongoing support to the families of our residents. Caregiving is a tremendous job, one that is full of love, but can also be physically, mentally and emotionally draining. Know that you’re not alone in this journey. If you need a short-term respite break, or are looking for a long-term residential option for your loved one, give us a call today.